Contemplating about the origin of things the etymology of Greek language has often been a guide, since we still use words that have their origin 3000 years back in history. 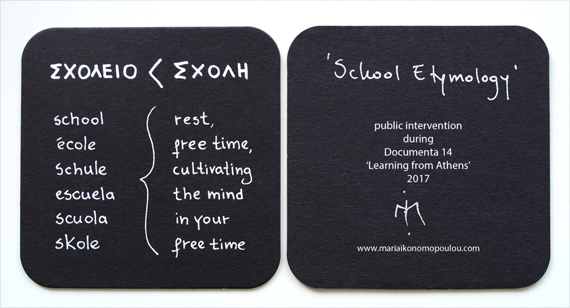 Inspired by the working title of Documenta 14 Learning from Athens I was considering what I would like visitors to learn from Athens and then thought of of the etymology of the word 'school'. The word 'scholío' comes originally from the word 'schóli' that means 'pause', 'free time', 'having finished your work'. In that sense going to school is actually an enormous privilage, since people that need to work don’t have the time to cultivate their minds.